Primrose stocks a wide range of mole deterrents - both humane and clinical. Our ultrasonic repellents work by emitting ultrasound, inaudible to humans, but painful to moles causing them to vacate the area. Primrose stocks both battery and solar powered repellents, and we recommend you buy one of each, turning the former off in the brighter months. 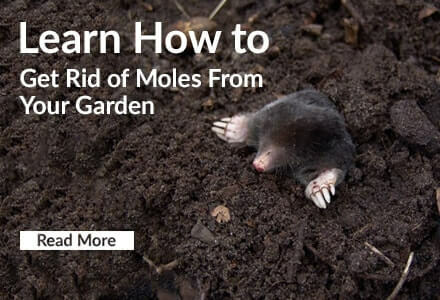 We also stock mole traps starting at only £2.99, complete with a no human contact guarantee, ensuring the moles are not put off by the smell of human scent. Moles can cause a lot of damage to your lawn. Here at Primrose we have a wide range of mole deterrents and repellents for you to choose from to get rid of the moles damaging your garden. Varying from ultrasonic solar mole repellers to mole tunnel traps, you are sure to find a product to suit you and your garden. 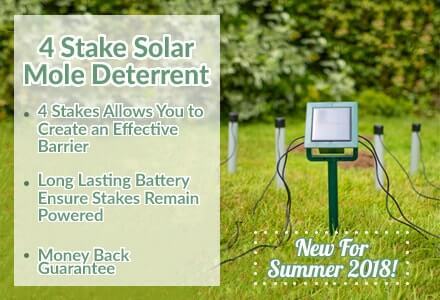 Mole deterrents are humane solutions to your mole problem. Designed to evict moles without harming them, solutions include ultrasonic repellers and mole repellent granules and bulbs. Ultrasonic repellers emit a low frequency boom, designed to mimic the sound of other moles and machinery. Hearing such sounds, a mole will move to another area of its vast tunnel system as they are solitary animals. Granules are soluble in water and work by affecting mole's primarily food source - worms - causing them to taste funny and giving diarrhea. It is unclear how bulbs affect moles, but it is likely they emit a horrible smell. Bulbs were first used in Sweden before being exported worldwide.